Seamless knitted glove with Dyneema Diamond Technology and polyurethane palm coating. The liner, made with Dyneema Diamond Technology, provides the maximum level of cut resistance without the use of abrasive materials. Polyurethane palm coating provides outstanding abrasion resistance and an excellent grip. The seamless construction of the soft yarn provides an exceptional level of comfort, whilst the open back style allows for excellent breathability. Designed to be close fitting to give maximum dexterity for the most tactile of operations. Elasticated knitted wrist provides a secure fit and keeps hands free from dust and debris. 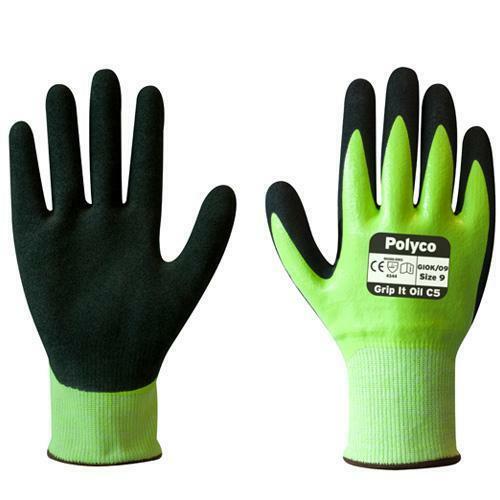 Polyco Capilex TP Work Gloves conform to: EN 388:2003 4.5.4.3 safety standards. Suitable for work where protection from abrasion, liquid and cut resistance is required but good grip is also necessary. 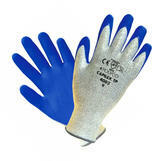 Nitrile coated high level cut glove, Micro-foam coating offers excellent grip in oily conditions. Nitrile dipped palm and fingers for fluid and abrasion protection, high Level 5 cut resistance. 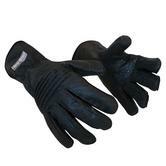 Seamless design with Nitrile dipped palm and fingers - Excellent grip in oily conditions. Wenaas Protector Cut Level 5 resistance Gloves 6-6912 conforms to: EN420:2003, CE Category 2, EN388:2003 4.5.4.3. standards. SKYTEC Ninja Knight gloves - maximum EN388 mechanical protection of 4-5-4-4, excellent wet and dry grip. Tear and abrasion resistance safety glove made with High Performance Polyethylene and Glass, which is good cut resistance barrier. The glove retains flexibility despite its high protection levels, anatomically designed for comfort and perfect fit. Elasticated wrist provides a secure and more comfortable fit. Treated with Actifresh to kill bacteria and promote freshness. Seamless knit shell offers a high level of cut and abrasion protection. Palm and full finger coating over knuckles helps to prevent liquid penetration. The ideal combination of high finger sensitivity and extreme cut protection. Specially formulated nitrile coating has thousands of microscopic pockets that disperse fluids for better surface to hand contact to help prevent slipping. Honeywell NorthFlex Oil Grip NFD35X Cut Resistant Glove conforms to: EN 420 Cat. II EN 388 4.5.4.3 standards. Highest needlestick resistance available offered by the layering of SuperFabricg brand material. Tested using 25 gauge hypodermic needles. High level of cut resistance. Improved fit and feel from memory span liner. Back-of-hand knuckle padding for protection. Large silicone pattern on the palm for better grip. Polyco Hexarmor NSR 4041 Cut and Needlestick Resistant Gloves conforms to: EN388 4.5.2.2. hand protection standards. Seamless, high cut resistant liner manufactured from a mixture of HPPE. Coated with foam nitrile , repelling any moisture and oil away from the surface. 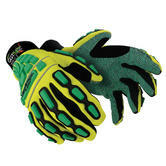 High performance glove for safe handling in a variety of higher risk applications. Conforms to EN388 4.2.4.5 , EN420. 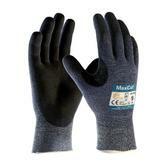 The MaxiCut Ultimate cut resistant glove made from high performance yarns and fibres. ATG 44-3745 Cut Resistant glove offer cut protection (level 5) whilst maintaining high levels of comfort. Glove reinforcement - between the thumb and forefinger and thumb, improves cut resistance and extends glove life. Unique ATG glove form: the "hand at rest", reducing hand fatigue and increasing comfort at work. Latest knitting technology - utilized to produce smooth fingertips improving sensitivity. The well-being technology eliminates all traces of process chemical and odours, making this glove - Skin friendly. PU Coated Cut 5 Resistant. Professional gloves giving the highest cut protection level combined with a great grip, dexterity and comfort. No loss of dexterity with a close, secure fit. Seamless construction gives comfortable protection. PU coating provides excellent abrasion and grip in wet and dry conditions. Ideal for glass handling, automotive, maintenance, construction, tiling and engineering assembly. Blackrock Advance Men Work Gloves conform to: EN420 Cat. II and EN388 4.5.4.3 protection standards. The HexArmor 9011 gloves are medium duty safety gloves with optimal cut resistant palm and palm side fingers. The gloves protect against cuts to the highest level and puncture, tear and abrasion to a very high standard. These gloves are used in various industries. 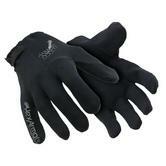 Palm and finger protection areas are made from layering SuperFabric material. SuperFabric material is made from lightweight, breathable yet strong polyurethane. It is reinforced with armour dimples ensuring ultimate strength and protection. Polyco HexArmor 9011 Cut & Puncture Resistant CUT 5 Protection Work Gloves conforms to EN388 Rating 4544. HexArmor® sets the industry standard for needle protection with innovative solutions for a variety of applications. Needlestick Protection: Highest needlestick resistance available provided by the layering of SuperFabric brand material. Hypodermic Needle Tested: Tested using actual 25 gauge hypodermic needles. Cut Resistant: Highest level of cut resistance in enhanced areas, Level 5. Comfort: Lightweight spandex shell with elastic wrist. Liner: Recommended for use as a liner with the appropriate top glove. Polyco HexArmor X 6044 Needlestick Resistant Underglove conform and approved EN388 4.5.2.3. standards. The HexArmor Hercules NSR 3041 Needle Stick Resistant Gloves are heavy duty, fully needle resistant gloves and give the highest needle stick resistance available, due to their design and layering of SuperFabric materials. As well as being extremely needle resistant the HexArmor Hercules NSR 3041 Needle Stick Resistant Gloves are incredibly abrasion resistant and also feature optimal grip. Polyco HexArmor Hercules NSR 3041 Cut Resistant Gloves conforms to: EN388 4.5.2.2. Cut Level 5 safety standards. Manufactured from lightweight spectra fibre. The fibres used improve the products durability. Secure fit, designed with a seamless knit improving comfort and security. Achieves the highest level of cut protection at level 5. Non-absorbent which makes this glove ideal for the food industry. Ansell Marigold Industrial Limited Ub10 Anti Cut Ultrablade Glove conforms to EN 420 Cat. III EN 388 4.5.4.X EN 407 X1XXXX safety standards. Dipped in nitrile improving product durability & grip. Improved comfort with a breathable shell. Provides exceptional grip in both wet and dry conditions. Manufactured with nylon and class fibre materials. 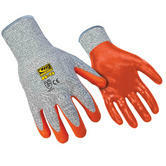 Ringers R-5 Nitrile Coated Orange/Grey Glove conforms to EN388 Safety Standard 4.5.4.3. The Polyco Blade Runner glove provides maximum cut resistance due to the innovative Coruscate yarn. Maximum cut resistant level 5 compliant EN388 safety standards. The innovative Coruscate yarn attains the maximum cut resistant level (5) as defined by the European Standards. 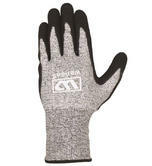 The special coating on the yarn provides a level of comfort not previously associated with level 5 cut resistant gloves. 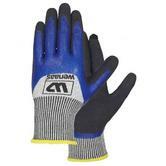 Gloves are made from a coruscate high cut resistant yarn with a flexible nitrile coating. 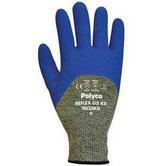 Polyco Blade Runner Stretch Cut Resistant Gloves conform to standards: EN420 Cat.2 EN388 1.5.4.X. safety standards. The seamless knitted Tensilite® liner has the highest level of cut resistance. European standard EN388 Cut Level 5 resistant work glove. Elasticated at the wrist to ensure a tight, secure fit. The 3/4 latex coating gives excellent grip in dry and wet conditions. Puncture Resistant - Flexible latex coating offers added protection against puncture hazards. Cut Resistant - The seamless Tensilite® liner provides high levels of cut resistance. Comfort - The yarn is made with a soft finish to provide exceptional comfort to the wearer. Grip - Excellent grip in wet and dry conditions. Flexible - Latex coating offers high flexibility. Polyco Reflex G5 KD Cut Resistant Latex Coated Gloves conforms to: EN 420 Cat. III EN 388 3.5.4.2. safety gloves standards. Cut Protection is a delicate balance. Most people want the highest cut protection with the best dexterity. That ideal cutproof yet dexterous fabric has not yet been perfected. But in the meantime, we have some truly excellent Cut 5 cut resistant gloves. The keenest priced Wenaas Protector is also possibly one of the most advanced and slim, dexterous cut 5 gloves we have seen. This is due to the advances in weaving technology , which allows the cut 5 fabric to be thinly dipped in grippy foam nitrile. 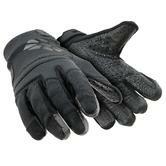 This is an exceptionally functional 3/4 dipped grippy, cut resistant glove. 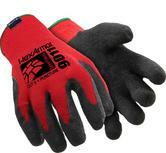 ATG Maxicut OIl Palm 34-504 glove is another favourite cut resistant glove. It is very thin, and yet is also cut protection level 5. The Polyco Granite leather and kevlar cut 5 gloves give robust cut protection, within the comfort of leather. The real body armour comes with the Impact protection gloves that now have cut resistance. This new development within the glove industry allows us to offer you Impact protection on your knuckles, along with flexible hi viz stretch spandex, while you get CUT 5 protection. The Polyco Hexarmour Needlestick resistant and the Stainless Steel Chainmail Knit Gloves bring in the highest needle and knife protection on top of Cut 5 blade protection.